Christopher Hale reports on a long campaign to discover the truth about the killing of Malayan villagers by British troops in 1948. 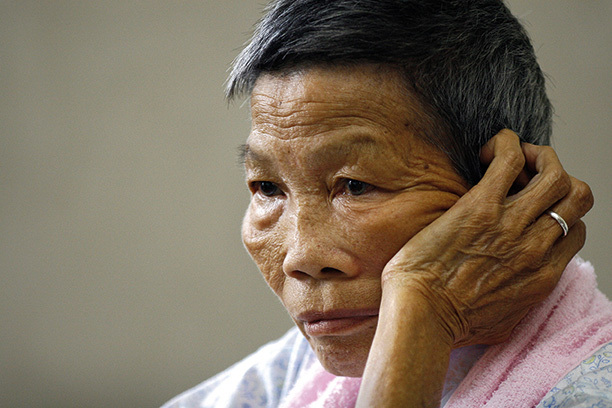 Eyewitness: villager Romen Bose Tham, pictured in 2008. Getty Images/AFPFor two days in May the restless spirits of 24 men shot dead by British soldiers in a Malayan village 64 years ago haunted Court Three of London’s Royal Courts of Justice. The incident is often referred to as Britain’s My Lai – after the Vietnam War atrocity when ‘Charlie Company’, led by Lt. William Calley, murdered between 307 and 504 unarmed civilians on March 16th, 1968. This year, after a long campaign, lawyers acting for the relatives of the dead men finally persuaded the British government to reconsider what they assert is ‘a grotesque, on-going injustice’. Since the killings at Batang Kali more than six decades ago successive British governments have refused to hold a public enquiry into what took place. The decision whether to proceed with an enquiry will not be known for some time. Even so, the proceedings in Court Three generated a great deal of new historically valuable information – not only about what happened in Batang Kali but about how and why a ‘very British cover up’ was maintained for so long. There is no dispute that on December 11th, 1948 a 14-man patrol from the 7th Platoon, G Company, 2nd Battalion Scots Guards, led by two lance-sergeants, Charles Douglas and Thomas Hughes, entered Batang Kali where they encountered 50 or so unarmed villagers. The tiny settlement was part of the Sungei Remok rubber estate in the state of Selangor, which at the time was a British protectorate. Six months earlier, in June, a succession of attacks by Communist guerrillas had led the British authorities to declare an Emergency – the beginning of an undeclared war that was to last 12 years. By the time the platoon left the village the following day 24 men had been shot dead. The first report of the killings in the Singapore-based Straits Times sounded a shrill note of triumph: ‘Police, Bandits kill 28 [sic] bandits in day … Biggest Success for Forces since Emergency Started’. It would not take long for the official story to unravel. ‘Good news’ like the Batang Kali operation was in short supply at the end of the first year of the Emergency. The roots of the conflict go back to the Japanese occupation of Malaya and Singapore, which began in February 1942. The traumatic loss of Singapore to a grossly underrated Asian foe shamed and humiliated the British and led many Asians to reassess their former masters. In the first months of the occupation the Japanese slaughtered many thousands of Chinese civilians in Singapore and across Malaya. Japan had been waging a brutal war in mainland China since 1937 and alleged that the Chinese in Malaya were a security risk. Many young Chinese fled into the dense Malayan jungle, where they began to organise guerrilla units to fight back against the Japanese. The Malayan Peoples Anti-Japanese Army (MPAJA) was dominated by the Malayan Communist Party (MCP) and by the end of the war was backed by the British ‘Force 136’, a branch of the Special Operations Executive. After the Japanese surrender in 1945 the British honoured the MPAJA , awarding its future leader Chin Peng an OBE. As India moved towards independence the chronically indebted postwar British government clung onto Malaya, with its valuable tin and rubber resources. Although the returning colonial power signalled that independence was on the agenda, it seemed to both a new generation of Malay nationalists and the Communists that it was ‘colonial business as usual’. This was intolerable. The MPAJA now became the vanguard of anti-British resistance, as the Malayan National Liberation Army (MNLA), turning their British-supplied guns on the returned colonial authorities. The MNLA was backed by a secret army of supporters known as the Min Yuen (People’s Movement). MNLA fighters depended on the Min Yuen and Chinese villagers, willing or unwilling, for essential supplies. This was the background to the events that unfolded in December 1948 at Batang Kali. It explains why, to begin with, the British could claim that shooting Chinese civilians on a rubber plantation was a ‘success’: in the eyes of British troops, any Chinese-Malayan villager might be a ‘bandit’ – and thus ‘fair game’. We now have a better idea of what happened next and how the ‘successful operation’ story rapidly began to crumble. Some of the surviving villagers told their story to Li Chen, the Chinese consul-general, who held a press conference on December 21st. The following day the British owner of the Sungei Remok Estate, Thomas Menzies, who had serious clout in the British estate-owners’ community and was no doubt dismayed by the loss of 24 workers, publicly stated that his labourers had a long record of good conduct. By December 24th the Straits Times was calling for a public enquiry. Faced with this escalating disquiet, the British spun a different story, a narrative that has been maintained in official accounts to the present day, claiming that the 24 villagers had been ‘shot while trying to escape’. But, whatever the form of words, the British could not smother the truth. At the end of January the British Communist MP Philip Piratin demanded that Arthur Creech-Jones, the colonial secretary, explain the actions of the Scots Guards. Creech-Jones replied that an ‘enquiry by the civil authorities’ had concluded that ‘had the security forces not opened fire, the suspect Chinese would have made good an escape, which had obviously been pre-arranged’. Creech-Jones’ ‘enquiry’ into a ‘necessary but nasty operation’ terminated the debate about the Batang Kali killings until the beginning of December 1969, when a former National Serviceman called William Cootes made a confession to the People, a British Sunday newspaper. Cootes appears to have been motivated by the furore unleashed by US journalist Seymour Hersh’s revelations about the My Lai massacre the previous year, which had provoked a debate about whether British troops might have been capable of committing such an atrocity. Public opinion resisted such slurs but Cootes knew better. He had been one of the 14 Scots Guardsmen who had entered Batang Kali. In court, the lawyers representing the claimants repeatedly and eloquently emphasised evidence that pointed to ‘intentional extra-judicial execution’. Witnesses had observed members of the Scots Guards platoon dividing the villagers into groups and then escorting them away from the village: ‘They weren’t actually running, but just walking past and away from the village.’ Evidently no attempt was ever made to escape. A further grotesque anomaly is that all the men were killed: if they had been ‘shot trying to escape’ it doesn’t make any sense that none survived. This pattern of fresh revelation followed by denial and cover up was repeated after the broadcast in 1992 of a BBC Inside Story television documentary, ‘In Cold Blood’. This time a Malaysian police enquiry was launched and then aborted. Documents referred to in court reveal that the Batang Kali massacre remained a highly sensitive issue. To this day the British government has not changed the story that appears to have been fabricated more than 60 years ago – ‘shot trying to escape’. Thanks to the lawyers acting for the surviving relatives of the Batang Kali massacre this long and troubling cycle of denial may at last be properly and openly resolved – if the two judges who heard the arguments decide to recommend a public enquiry. For historians of the British Empire and the traumatic process of decolonisation that followed the Second World War a new enquiry promises to cast fresh light on the longest war fought by British troops in the 20th Century – the Malayan Emergency – and the counter- insurgency techniques developed in South-east Asia that influenced American strategy in Vietnam and continue to impact on bitterly contested campaigns in Iraq and Afghanistan.